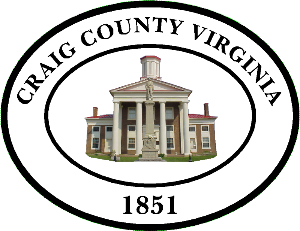 The Craig County Planning Commission will conduct a public hearing which may be continued or adjourned on Thursday March 30th, 2017 at 7:00 pm , or as soon thereafter as the matter is heard during the Board of Supervisors meeting at the Craig County Courthouse in New Castle, Virginia, to consider the application of Wilderness Adventure/Gene Nervo for a “Use Not Provided For” permit to allow them to hold a two day music and arts festival with camping and lodging to raise money for camp tuition and scholarship kids. Tax map #38-A-33. This parcel is zoned A-1 Agriculture, Limited and is located at 11176 Peaceful Valley Road, New Castle, VA 24127. The property contains 470 acres and is located in the Potts Mountain District on the right side of State Route 611 approximately 2.5 miles from Route 615, approximately 7 miles from the Town of New Castle in Craig County. Public comment on the application may be submitted by writing to P.O. Box 308, New Castle, Virginia 24127, by calling 864-5010, or at the public hearing. Craig County Board of Supervisors will hold their meeting April 6th, 2017 at 6:00 pm. Enter the Courthouse at the Court Street entrance. The meeting is upstairs in the Courtroom. Our friends from the North have arrived! Does anyone want to come out and show these crazy Canadian Cyclists a good time? Blue Connection will be providing some stellar entertainment, and we’ll be cookin’ up a good meal! They’ll be out EVERY Friday until May. That in mind, you probably want to get on this blue grass train early, we will likely sell out after the first two weeks!